Arguably, the worst aspect of the “peculiar institution” of slavery (as it was called in the American South) is the psychological torture masters inflicted upon their victims. Of course, that premise is a little bit erroneous. The black diaspora did organize under colonialism to break free: Gaspar Yanga in 1570 in Mexico and Toussaint L’Ouverture in late 18th-century Haiti. There was the 1825 revolt in Cuba and the U.S.’s Nat Turner a few years later. While some of these rebellions were successful, they were, obviously, anomalous events. Apart from safeguards like overseers and slave-master networks, it’s the psychological conditioning at work that prevented slaves from rebelling on a larger scale. The gashes, burns and bruises were quite apparent as outward symbols of slavery’s destructive force. But the scars slavery left on the minds of its survivors were just as gruesome. In “The Last Supper,” Tomás Gutiérrez Alea artfully explores the nature of this harm. The film centers around a Spanish count who, in 18th-century colonial Cuba, plucks up 12 of his slaves to recreate The Last Supper held between Jesus’ and his disciples. The count has good but misguided intentions of teaching them Christian values, but only the kind that permits and upholds slavery. Nevertheless, the slaves see through this fallacy and rebel against plantation rule. A key scene in “The Last Supper” is dinner itself. The space of the Count’s dining room is arranged to look every bit like Leonardo’s da Vinci’s 1494 painting of Jesus’ last meal. The Count is placed in the middle and is flanked by slaves on both sides. The room’s construction highlights this, with its entrance directly behind the Count. Yes, this scene unfolds at night-time in Havana instead of Jerusalem at dusk. But Alea blends 18th-century Cuban norms with Biblical cues to create an astute foundation for this period piece. 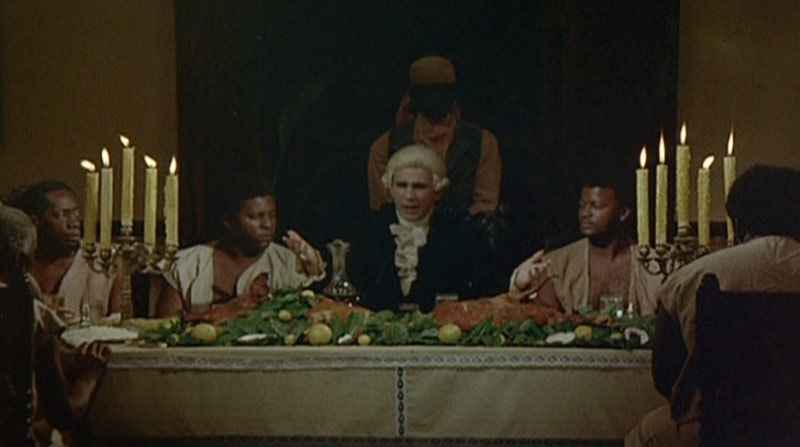 And so beautifully brought to life by cinematographer Mario García Joya: with the fluid and careful or anxious and abrupt gestures of the slaves, the glittering glasses of wine, quietly flickering candles, soft Afros and beards sprouting to frame dynamic brown faces, the lace at the Count’s wrist, the glint of an earring, the greasy sheen of meat for the taking. With all of these textual elements in place, the editing is able to elevate the mise en scène laid out for us so sumptuously. The dinner scene feels long. But this doesn’t detract from the delight viewers can draw from it. The camera doesn’t do the typical dance of medium shots and close-ups. There are more continuous takes. For example, the cinematographer doesn’t flit to capture every disciple up close. Sometimes, a response to a slave’s question can be heard off-screen. So, instead of feeling tedious, it just feels like a real dinner party. You can really focus and savour the joy of one slave who tells a rollicking joke about a boy and his family. You get drawn into the finesse of the Count’s tale of St. Francis. Your heart speeds up when the one slave who has been demure and sullen all night awakes to expounds on the nature of truth and lies. Apart from pace and atmosphere, this kind of editing (or lack thereof) creates a delicious tension. By filming the most crucial scene in one room, in what feels to the entranced audience like one long take, Alea gifts us with a taste of the psychological despair weighing on our protagonists. The Count’s rhetoric is too glib. Slaves must pose as sycophants or well-meaning jesters to avoid incensing their master. The setting of a dark and sticky night in colonial Cuba as well as the deafening absence of certain conversation points brews unease in the viewer. The film is as authentic as they come. It’s set in Cuba, Alea is a Cuban director and the organization who produced the 1976 film is Cuban as well. El Instituto Cubano del Arte e Industria Cinematográficos (ICAIC) was established in 1959 by the country’s government in order to celebrate its national talent. The actors portraying the slaves, such as Samuel Claxton, Idelfonso Tamayo and Tito Junco (the Cuban actor, not to be confused with the Mexican one), are also Cuban. (A note: I only found the slaves’ actors through the IMDB listing for “The Last Supper” and could only confirm that a few portrayed slaves. According to a 1978 review from New York Times film critic Vincent Canby, only Nelson Villagra, who plays the Count, was credited when the film was shown in New York City. Admittedly, Villagra was actually Chilean by birth. He sought refuge in Cuba, after exile following the rise of right-wing dictator Augusto Pinochet in Chile. Villagra’s political beliefs aligned with what ICAIC was looking for in its creatives. As a whole, I enjoyed watching the supper, with its ebb and flow of emotion, unfurl the way that it did. I am glad Alea made the decision that the scene should move in what is closer to real time as opposed to the condensed version of life we glean from films. Considering the context, Alea’s of an anti-colonial fantasy is endearing to me. It isn’t a simple glorification of the Cuban rebel spirit. It isn’t the sort of slave film that is vicious and cliché and pornographic with its violence. It isn’t the sort of the film that fishes for viewers’ pity with heartbreak, either. “The Last Supper” is a period piece, illuminated by another now-historical period, that is decadent to watch, coy with its revelations and therefore, exactly as much as it needs to be.